"I love the variety and challenges that come with not knowing what will walk through the door next"
Michael is an awesome vet! He looked after my cat Zack many times before he sadly died 18 months ago. 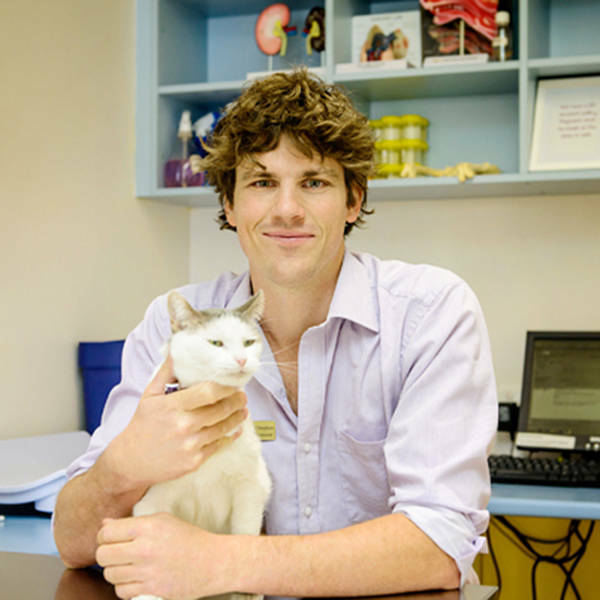 He's kind, warm, engaging and a bit of alright to look at too, so we reckon he'd make a great new Bondi Vet! He would be the best Bondi Vet - not only does he know his stuff. He has a real sense of Community. Did you know every Christmas he runs the Glow in the Park Event. So much fun for the community and their pets. Michael's little dog voice is the cutest: "Noodle, what are we going to do with yoooou?" Quirky, modest & so so kind. His approach to his work and his patients will have viewers falling in love with him. The real deal, and totes perfect for the job! Hermy and Merlin loved Michael, the best care always and so kind. Nothing is too much trouble- saying goodbye to Merlin we sat on the floor and sang our favourite Lionel Richie song – such an amazing special man. As Mr Richie says – he is “an angel in disguise”. I personally know Michael and worked with him at alexandria vets for over 3 years. Not only is he a great and funny guy (perfect for TV), he is a fantastic vet that knows his stuff and truly loves animals! Mike has provided us with great advice for our greyhound! Such an approachable guy whose number 1 priority is your animal! Michaels a natural with animals,he is always concerned about how both the animals and humans are coping. He is super smart and always make sure you understand what's going on. Kind considerate and easy to talk to. Best vet ever ! So glad he cares for our brood.